Rockstar Energy OTSFF Yamaha’s Matt Goerke, who came into the series recovering from a pre-season injury, concluded the Rockstar Energy Triple Crown AX Tour in Barrie, ON this past weekend with a noteworthy third place standing in the 450 Pro points. His teammate Dillan Epstein, racing his first full arenacross series, held up his end of the bargain by sealing the top five with fifth place. The six-round AX Tour, which wrapped up with a double-header event at Barrie’s Molson Centre arena on Friday and Saturday night, saw Goerke end up on the podium in third place on the first night of action. After posting the fourth quickest qualifying time, he started third in his heat race but crashed while attempting to make a pass for second place and had to settle for fifth at the finish line. This meant he didn’t get a chance to pick up some extra points in the Clash. In the main, Goerke had an issue just off the gate, which meant he started dead last. It didn’t look good for the Florida native at this point, but Goerke is not the type to let a back-of-the-pack start throw him off his game. Showing his mettle, the current 450 National Motocross champ rebounded nicely to slice and dice his way into a third place finish at the checkered. On night two Goerke qualified second, to then go and grab the holeshot in his heat race, which he won hands down. This result did put him into the Clash, which he finished in fifth. In the main event, Goerke was recovering from a mid-pack start only to get hit by another rider as he tried to overtake him for third place. 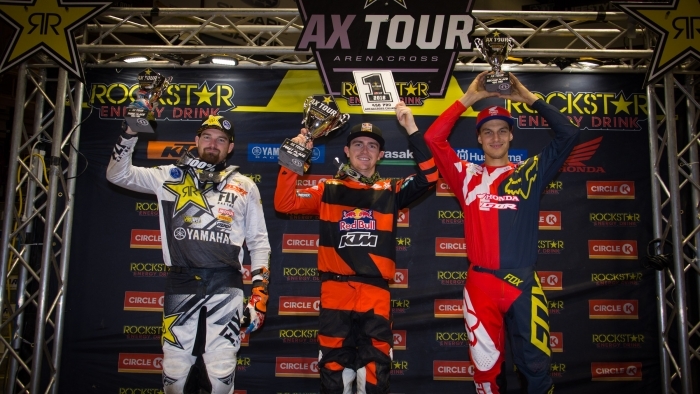 Although Goerke managed to get back into the fray quickly enough, he would finish the last race of the AX Tour in fourth place. For his part, Epstein struggled most of the weekend. He qualified in eighth place on Friday night but advanced to the main with a fourth place in his heat race. This left him out of the Clash, however. The Californian got a bad jump on the gate and like Goerke, started at the back of the pack to eventually claw his way into a seventh place at the finish line. On Saturday night, Epstein recorded the fifth quickest qualifying time, which was an improvement over the previous night. He again was left out of the Clash but finished top five in his heat race, nailing down fourth at the checkered flag. Another bad start in the main left Epstein battling in the back of the field. Although he gained some ground, he crossed the finish line in eighth place. AMO series winner Jake Tricco won factory rider for a day under the OTSFF truck and had a successful weekend of AX racing in Barrie. Congrats to Jake from all of us at OTSFF. The Rockstar Energy Triple Crown Series will resume, after a five-week break in the schedule, on Saturday, May 26th in Calgary, AB, where the first round of the Motocross Tour kicks off at Wild Rose MX Park. For more info on the series please visit: http://www.rockstartriplecrown.com/index.html.